Art of Eight Training and Fitness Center ("Ao8") is your destination for boxing, kickboxing, muay thai, and MMA in San Diego. Art of Eight was founded in 2011 in order to bring the highest quality instruction to a boxing gym in San Diego. We are a fitness center at heart and our professional trainers and staff are here to make sure your gym experience is clean, safe, and dynamic. Our team of world champion instructors combined with a positive and constructive atmosphere makes Art of Eight the premier muay thai gym in San Diego. We have one the newest, top of the line kickboxing gyms in San Diego. Our 8,000 square foot facility has a full sized professional boxing ring, weight room, and 28+ punching and heavy bags. Quality equipment and facilities should be a major deciding factor when finding a boxing gym in San Diego. 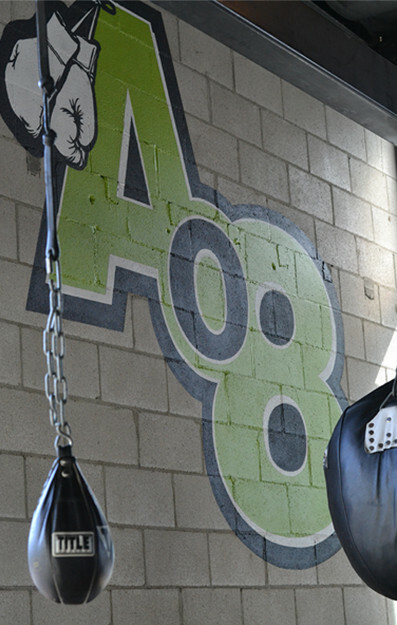 Art of Eight has Hoist fitness equipment, top of the line digital lockers and spacious showers so you are sure to experience the highest quality kickboxing gym in San Diego. We offer one of the most diverse selections of classes when compared to other boxing and muay thai gyms in San Diego. We build healthy bodies from the ground up with novice and introductory courses to improve conditioning and are tailored to reduce injuries. Our 101 and Pro level classes are designed to teach and improve proper striking, kicking, footwork, and grappling techniques. Muay Thai, also known as the art of eight limbs due to the fact that it utilizes a combination of fists, elbows, knees, shins and feet in striking. It is a highly effective stand up style that started in 16th century Thailand as an art of war and has become popular as a ring sport. In recent years, due to the efficiency and effectiveness for both close quarters fighting and clinch work, Muay Thai can be learned as an art, sport or for fitness and is for people of all ages, fitness and experience levels; whether you are a first time student or an experienced veteran, there is a class for you. When it comes to Muay Thai in San Diego Art of Eight is the clear choice with former and current champions helping you develop your skills and take your game to the next level. We also offer unique cross training and kids programs to maximize fitness. Our cross training classes consist of full body strength and conditioning to build a better stronger you through dynamic exercises. These principles are prevalent in all of our classes including our kids program. The kids program is focused on teaching the basic principles of boxing and kickboxing while incorporating other martial arts, self defense and fundamental MMA techniques. The true objective of the program is to instill the principles and benefits of personal development, self confidence and physical fitness into the students. A welcoming and family friendly atmosphere is important when selecting a boxing gym in San Diego. A healthy family is a happy family. The Kid’s Program introduces little ones to kickboxing with emphasis on discipline and living a happy, healthy lifestyle. You can enroll the little ones in our Kid’s Program while you take a class of your own. Or, you can schedule time with one of our personal trainers. Art of Eight is conveniently located off the 163 at Balboa and offers a varied selection of classes every 30 minutes for your convenience making it one of the most accommodating kickboxing gyms in San Diego. When considering price, quality, expertise, atmosphere, and location, Art of Eight Training and Fitness is the premier choice for a muay thai gym in San Diego. Come visit us today and try a class for free!